You will earn 1,585 Reward Points. Earn 1 reward point for every 1 dollar spent. Brewing on-the-go is easy with this Grindmaster-Cecilware PB-430 Precision Brew Digital Shuttle Brewer, a highly rated machine. This brewer is 25 inches tall. Independent or simultaneous brewing on twin brewers. Cycle Counter - The brewer counts the total number of brew cycles. Diagnostics - The front display will indicate any water or heater failures. Programming Lockout - The brewer settings can be “locked” to prevent tampering. Warranty - 2 years parts and labor on the brewer. 4 years part warranty on the control board. Brew Basket Lock - The brew basket(s) are automatically locked in-place throughout the brew cycle. The ACS-1 Shuttle® is the classic 1.5 gallons (5.7L) stainless steel, air insulated, radiant heat Shuttle®. Model PB-330 is a single, digitally controlled brewer. It includes (1) radiant heat, air-insulated, ACS-1 Shuttle®. Hot Water Faucet - For use in making tea, soup, hot chocolate. Using the faucet will not affect the brew volume. Precise Brew Temperature - The brewer will hold the brew temperature to +/-1°F during the complete brew cycle. 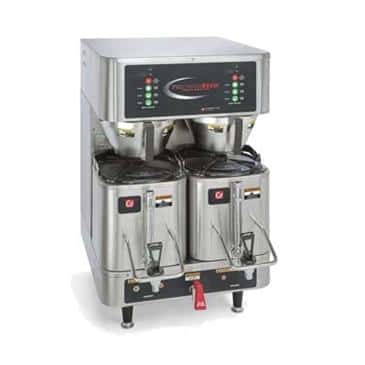 Model PB-430 is a twin, digitally controlled brewer. It includes (2) radiant heat, air-insulated 1.5 gallon (5.7L), ACS-1 Shuttles®. Low Temp/No Brew - Allows the brew cycle to begin only when the water has reached optimum brew temperature. Program On or Off. 3 Brew Volumes - From ½ gallon (1.9L) to 1½ gallons (5.7L). Each volume can be set by ‘teach’ mode to eliminate trial-and-error set-up. The following brew variables are programmable through the front display: Water temperature, brew volume, pulse brewing sequence, bypass percentage, low temp/no brew. Bypass adjustment - For Large and Medium brew volumes, program up to 33% of the total brew volume to bypass the coffee grounds. Changing percentage of bypass will not affect brew volume. Pulse brewing/pre-infusion - Allows the brew sequence to extract up to 20% more dissolved solids per batch of coffee. Programmable: number of pulses, pulse-on time and pulse-off time. Changing pulse sequence does not affect the brew volume.